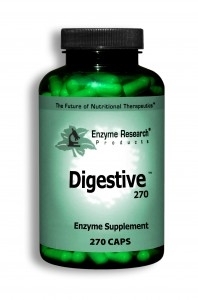 Enzyme Research Products Digestive Plant Enzyme. Enzymes are needed for every chemical reaction that takes place in your body. They are connected with every working organ and facilitate all metabolism. Vegetarian capsule (Hydroxypropylmethylcellulose and water), cellulose, and L-Leucine. Wonderful prices, fast shipping, clear communication, will definitely shop here again! Love this product-wish you had a sales once in a while-I order often!